With A Time of Dread being such a heavily anticipated novel by myself and many of my peers (pub date in the US is tomorrow, 1/9/18), I wanted to see why there was so much hype surrounding Gwynne’s first series, The Faithful and the Fallen. As a late bloomer to more recent fantasy, I have a lot of reading to do in order to catch up. This was my first listen-through of Malice, the beginning of a 4 book series, and I look forward to finishing out the series as time allows, especially since Malice was the only one in the series available on Audible in the US. In the Banished Lands, a war of the gods is set to commence and an ancient prophecy foretells of signs that point to its imminent manifestation: stones will bleed, giants will roam the lands once again and clash with the race of men, and there will be a day when the sun turns black at its highest peak. On this day, two chosen champions, one good and one evil, will rise: The Bright Star and the Black Sun, leading whoever chooses to follow into a war to end all wars, covering the lands in death and destruction. 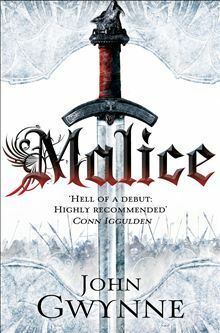 Though the book stars out quite slow (and trust me, you need to bear with it and get through the beginning to enjoy what is to come), Malice has all the makings to begin a wonderful and epic fantasy series. It is comprised of several different viewpoints, the main one being of a young boy named Corban (and yes, it is a typical trope but stay with me), and each POV intertwines to culminate in a glorious ending. Though not every story needs a likeable, good natured character (see Prince of Thorns by Mark Lawrence), Gwynne has taken the opportunity to make 90ish% of his characters inherently good in a land full of darkness. This creates an air of mystery throughout the entire novel as we await to see who will champion both sides of the war. Much like other epic fantasy series out there, the world-building here is top notch and expands even more so with the different POVs, even adding hidden underground passageways and thick, dark forests that hide creatures long thought extinct or myth. All in all, I thoroughly enjoyed Malice and am ready to start Book 2, Valor. Malice is a recommendation to anyone who enjoys epic fantasy or those who enjoy their fantasy with a little bit of grimdark mixed in. Also of note: this one is a completed series so you can read all 4 through without having to wait several months to a year; the only thing you have to worry about is the post. Thank you! Not your cup of tea or what?